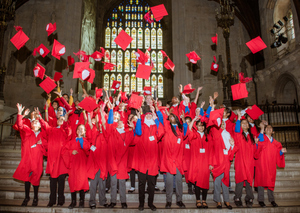 Pupils from three London schools graduated from Mosaic’s Primary School Programme at a very special ceremony held at The House of Lords, Westminster. In the presence of their mentors, teachers and families, pupils from St Pauls Whitechapel Primary School, Old Palace Primary School and Harry Gosling Primary School shared their experiences of participating in the programme. Mosaic would like to thank Human Appeal, the Aziz Foundation, TRS Foundation, John Laing Foundation and the players of the People’s Postcode Lottery for their generous support of the primary school mentoring programme. Mosaic’s Primary School programme seeks to equip young people with the skills and confidence they need to connect education to a work at an early age. Often the programmes focus on girls and their mothers, raising aspirations and broadening expectations of what’s possible in adult life. Volunteer mentors from professional backgrounds act as role models to the pupils and encourage them to aspire to careers in a range of different sectors.